Mainstream SETI scientists and ancient alien theorists don’t agree on much, but one opinion they share is that the undisputed authority on the possibility of alien existence was the late Carl Sagan (1934—1996), whose voluminous writings on the subject have had a profound influence on ETI research. But how many Carl Sagan fans know that while the renowned scientist was at Stanford University, he produced a controversial paper, funded by a NASA research grant, that concludes ancient alien intervention may have sparked human civilization? Author Donald Zygutis lays out a compelling case that points to a cover-up by the Pentagon and NASA, who may have buried it soon after it was written. How significant is the Stanford Paper? The answer may lie in another question: How would a science-backed theory and search strategy to guide the discovery of alien artifacts among our own ancient civilizations impact the worldwide institutions of government, religion, and culture? Recently rediscovered by the author, Sagan’s lost Stanford paper is the central theme of The Sagan Conspiracy. Groundbreaking research and paradigm-changing material challenges conventional thinking about the People’s Scientist—and maybe even the origins of human society. Sagan even conceived of the likelihood that the ancient Sumerian civilization had been visited and influenced by beings from other worlds as evidenced by ancient manuscripts, among other artifacts. 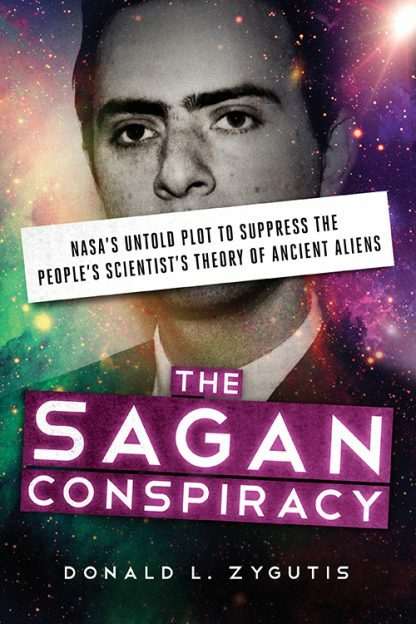 As we celebrate the 20-year anniversary of Carl’s death, The Sagan Conspiracy is sure to fundamentally alter how the world thinks about extraterrestrials. Donald L. Zygutis is a graduate of Corban University and has 40 years of experience investigating and analyzing the life and work of Carl Sagan as a leading skeptic and ETI theorist. Zygutis resides in Bend, Oregon.